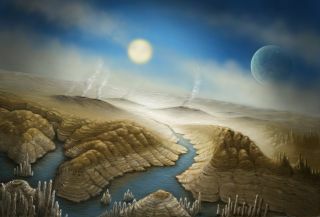 Artist's concept of the surface of the newfound exoplanet Kepler-452b, which is about 60 percent wider and five times more massive than Earth. This illustration imagines that a runaway greenhouse effect has begun to take hold on Kepler-452b, driving off much of the planet's surface water. The increased energy output of its sun might currently be causing Kepler-452b to heat up and lose its oceans — if the planet does indeed harbor oceans — to evaporation, subsequent breakup by ultraviolet light and atmospheric escape.